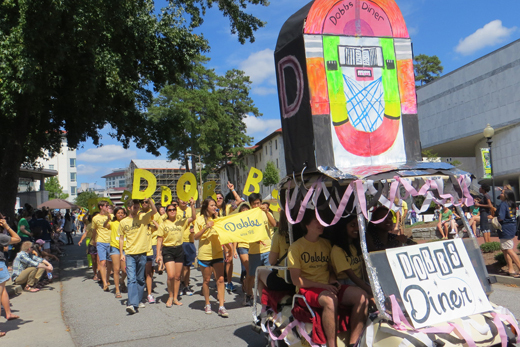 Emory's annual Homecoming parade steps off Saturday at 12:30 p.m. Photo by Michelle Valigursky. For Peter Salomon 89C, returning to Emory this Homecoming Weekend culminates a longtime dream. Once a young Emory student taking creative writing classes, Salomon recently had his 2012 debut novel, "Henry Franks," named to the 2014 list of 10 "Books All Young Georgians Should Read" by The Georgia Center For The Book. "When I was a student, I'd walk through the Emory bookstore (back then in the Dobbs University Center) and dream of one day having a signing there," recalls Salomon, who released his second novel, "All Those Broken Angels," this year. "It's a dream come true to finally have that about to happen during Homecoming." More than simple reminiscing, the author's connection to Emory is deep. Like the fellow members of the Class of 1989 who will join him on campus for their 25-year reunion, he says, "We share a fierce pride and devotion to Emory." "The other day, while I was up in Atlanta for the Decatur Book Festival, I found myself walking around the Emory campus during my free time," says Salomon, who now lives in Florida. "It's been 25 years since I graduated and I still find myself driving over to Emory whenever I'm in town. When I talk to other graduates, both those that have since moved away from Atlanta or even those who still live nearby, I find that they all do the same thing." Salomon's book signing is just one of the many events offered as Emory celebrates Homecoming this weekend, Sept. 19-21. Major university-wide events like Saturday's Homecoming parade and concert by rock band Sugar Ray are bolstered by events geared toward specific classes and affinity groups. On the emory.edu/homecoming website, reunion registration pages and activities are consolidated by class year. "Guests may register to participate in campus-wide events and affinity group get-togethers via the Homecoming website at emory.edu/homecoming," says Gloria Grevas, director of alumni and student programs at the Emory Alumni Association. "We have an amazing lineup of activities this year, and the website makes planning your visit easier than ever with resources for accommodations, child care, dining, and much more." Homecoming festivities also reflect Emory's strong commitment to sustainability. To help Emory meet its 65 percent landfill waste diversion goal by 2015, Grevas notes, "several Homecoming events are zero landfill waste, which means that all materials from the event can either be recycled or composted. No trashcans are needed!" To make the most of your visit, first consult the Homecoming checklist. Welcome Centers: Alumni stopping by welcome centers at the Miller-Ward Alumni House or Peavine Parking Deck will get a free T-shirt and can enjoy a quick break, a Coke, a comfortable seat and a friendly smile. Open all weekend. 6 – 9 p.m. | Volunteer Emory's Reunion Reception | Miller-Ward Alumni House. To celebrate Volunteer Emory's legacy of more than 30 years and ensure its future, a five-year $500,000 fundraising effort is being launched to create an endowment supporting Volunteer Emory and its programs. The goal is to reach half of the endowment by the date of the reception. Drinks and heavy hors d'oeuvres will be served. There is no cost but registration is requested. Business attire. 8 a.m. | Homecoming Intramural 5K Run through Lullwater Park | Student Activity & Academic Center, Clairmont Campus. The walk/run will begin outside the Student Activity & Academic Center and run through Lullwater Park. Participants are encouraged to register online, but walk-ups are also welcome. On-site registration will be from 7 - 7:45 a.m. Prizes will be awarded to male and female winners in five age groups (21 and under, 22-29, 30-39, 40-49, and 50 and up). The run is hosted by PowerAde and the Emory Alumni Association. No charge for Emory University students, faculty/staff, alumni, friends, and families. 11 - 11:50 a.m. | U.S. Supreme Court Decisions Update with School of Law Dean Robert Schapiro | Gambrell Hall, First floor. Join the dean for his review and analysis of the last year in U.S. Supreme Court cases and decisions. Open to all with no charge; registration required. Noon - 3 p.m. | "Emory Street Eats" Food Truck Park | Woodruff PE Center Courtyard and Asbury Circle. All are welcome for a Homecoming lunch in the heart of campus. Guests may purchase from some of Atlanta's hottest new mobile food vendors. Pay for food at each truck; complimentary Coca-Cola beverages available. Registration required. 1 p.m. | Peter Salomon 89C Book Signing | Barnes and Noble at Emory. Peter Salomon 89C will have a book signing at the Emory bookstore. More information on the author and his work can be found at www.peteradamsalomon.com, www.allthosebrokenangels.com, www.henry-franks.com, www.facebook.com/peteradamsalomon, and Twitter @petersalomon. Sugar Ray performs at 2 p.m. Saturday on McDonough Field. Publicity photo. 12:30 - 5 p.m. | Homecoming Parade, Festival, and Concert | McDonough Field & Asbury Circle. Alumni are invited to cheer on, with friends and family, their former residence hall, fraternity, sorority or Campus Life organization at Emory's annual big, bold, blue and gold Homecoming parade. At 1 p.m. gates open to the festival/concert on McDonough Field. Music, games for all ages, food and fun (and beer or those over 21) will be on hand. And rock superstars Sugar Ray's concert begins at 2 p.m. No charge, ID required. Registration required. 6 p.m. | Emory Sports Hall of Fame | Miller-Ward Alumni House. This athletic tradition recognizes an elite group of student-athletes coaches and administrators. Registration required by Sept. 5. 2 - 6 p.m. | School of Nursing Alumni & Faculty Family Picnic | Mason Mill Park, 1340 McConnell Drive, Decatur 30033. Bring your family and friends and join Corrine Abraham, Sara Edwards, Joyce King, Sally Lehr, Terri Marin, Kathy Markowski, Sandra White and other School of Nursing faculty and instructors for a fun afternoon at the park with BBQ, lawn games and time to catch-up with classmates, faculty and friends. Open to Nursing alumni · $5/adult; no charge for children 10 and under. See the full schedule of Homecoming Weekend events, including parking, contact and registration information.